If you like watching ATV's on TV, the new season of Outsiders will not disappoint. The highly anticipated Daytona ATV Supercross (ATVSX) was no disappointment to the Pro racers, as well as the many spectators that ﬁlled the grandstands to watch the day unfold. 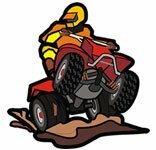 The 2016 ProX ATV Motocross National Championship (ATVMX) presented by CST Tires, an AMA National Championship, concluded today, September 9, after the twelfth and final round was held at the Soaring Eagle Casino and Resort (SECR) in Mount Pleasant, Michigan. Sunny conditions made for a great day of racing as Wienen Motorsports/Yamaha/Maxxis/SSi Decals/Walsh Racecraft/FLY Racing’s Chad Wienen and Maxxis/Liquid Wrench/Elka Suspension/Honda’s Joel Hetrick went head-to-head for the coveted National Championship. The post Stolen ATVs – Please Help appeared first on Stolen 911.